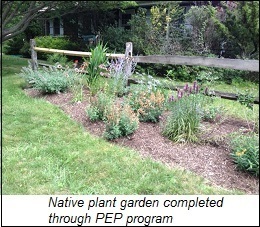 The Peconic Estuary Program (PEP) will provide financial rewards for homeowners who remove turf and pavement from their properties and add landscape that benefits the environment. Homeowners can be reimbursed up to $500 to offset the expense of installing green infrastructure on their properties, including rain barrels, rain gardens, and native plant gardens. Stormwater filtered through the soil, sand and gravel within rain or native plant gardens is cleaner when it enters groundwater, nearby bodies of water and storm drains. Rain barrels can catch rainwater from roof runoff for reuse in gardens rather than letting the water flow over paved surfaces and into storm drains and nearby waterbodies and groundwater. Mitigating stormwater runoff into the bays can help improve water quality, reduce nutrient pollution, and restore natural resources. Funds are limited and will be granted on a first come, first served basis. Visit the Peconic Estuary Program website to see if you qualify. The Long Beach City Council approved a resolution authorizing the City Manager to apply for two New York State Environmental Facilities Corporation grants. Grant funding would allow the City, in coordination with Nassau County, to convert the City’s 70-year-old wastewater treatment plant into a pump station. The pump station would transfer the wastewater from the City and Lido Beach to the County’s Bay Park Wastewater Treatment Plant (WWTP) for treatment, which has seen $455M in upgrades. The County, on a parallel track, is seeking to undertake its own project to transfer its treated wastewater from the Bay Park WWTP to its Cedar Creek WWTP ocean outfall. These projects would effectively remove approximately 60 million gallons per day of wastewater effluent containing over 15 tons of pollutants from Reynolds Channel and the Western Bays.